Data and images shown in Charctic use passive microwave data from the Defense Meteorological Satellite Program (DMSP) F17 and F18 Special Sensor Microwave Imager/Sounder (SSMIS). Data sets include the Sea Ice Index, Near-Real-time DMSP SSM/I-SSMIS Daily Polar Gridded Sea Ice Concentrations, and the NASA-produced Sea Ice Concentrations from Nimbus-7 SMMR and DMSP SSM/I Passive Microwave Data. The underlying data used to produce these images and graphs may be obtained from NSIDC. NSIDC produces the daily extent values using a five-day trailing mean. 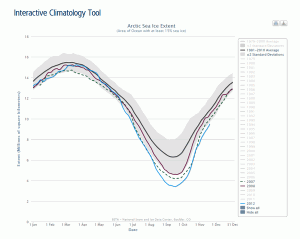 Graphs shown here may vary slightly from graphs displayed in Arctic Sea Ice News & Analysis, due to differences in handling leap years. However, the underlying data values are the same that NSIDC displays for its daily extent image and graph. 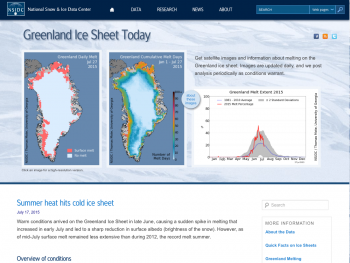 If you have questions about Charctic sea ice data, please see our Frequently Asked Questions about Arctic Sea Ice, or contact NSIDC User Services.